I was born in Santa Monica. I am 46 years old and I’m temporarily living in Ohio until september of this year. How did you start playing drums? Who influenced you? I started playing drums in 4th grade. When I heard music at a young age I always tuned into the rhythms and drums first. Earliest influences were probably the Beatles and everything I heard on the radio. After that, Buddy Rich and Carl Palmer (Emerson, Lake and Palmer). Where did you get the idea on using double bass drums? When we came up with new music it just happens, we never set out to write “metal stuff” or “punky” stuff. The music is what it is… Suicidal I guess. Using the double bass with Louichi, in 1987. 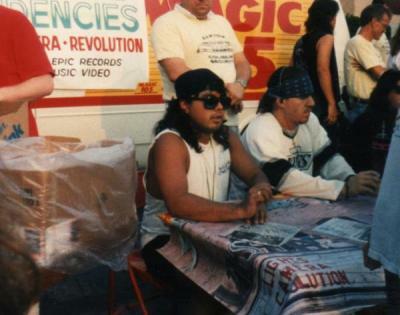 Was there any connection between Suicidal and gangs of Los Angeles? No gang connections. Just a bunch of fans and followers who liked dressing down with pendletons/bandanas. Couple of the best moments: while doing shows with Janes Addiction in Florida we found out “Lights, Camera… Revolution” was nominated for a Grammy. Play in LA (after being banned for a long time) at Verizon Amphitheatre. What’s your ST favorite song and your best drum line? No favorite ST song. A couple nice drum parts: Trip at the Brain and Lost Again. After leaving ST, I did some recording/CD’s for Uncle Slam (Amery Smith, Bob Heathcote and Jon Nelson), Beowulf (2 Cents) and a side project with Mike Clark called Bastion. Do you still meet any of the ex-bandmates? 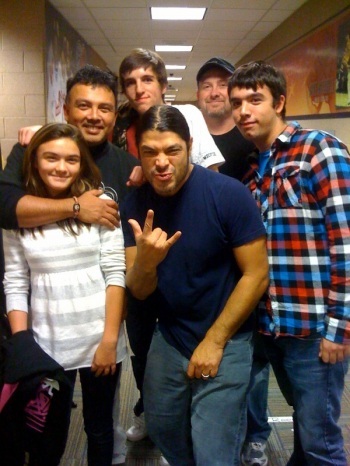 I just saw Robert with Metallica in october, spoke with Clark briefly around new years, Rocky it’s been a couple of years, I play with Louichi (Mayorga) in Horny Toad when I’m back home. Muir I haven’t talked to in almost 20 years. 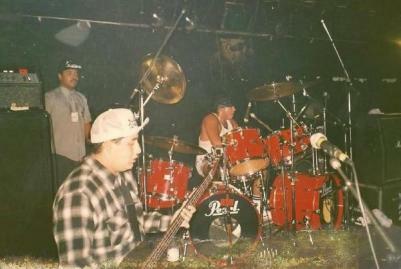 In Horny Toad, with ST former bassist Louichi Mayorga. Would you agree to take a tour with the classic Suicidal lineup Suicidal, with Muir, George, Trujillo and Clark? A reunion tour with the guys mentioned would never happen because of a few reasons: once Muir has made decisions about “his” band, he would never look back; Rob is too busy with Metallica and I don’t know if everyone would agree to it if it were at all possible. These days I’m trying to see my wife through her illness and being a good father to my son Jackson (18) and daughter Devon (13). I’ve been doing some writing and hope to get some of it recorded before too long. With his children Devon and Jackson (on the right). As far as leaving the band I was kind of put in a position where it woud’ve been uncomfortable for me to continue working with Muir and besides my wife was pregnant our first child. Muir was getting in his “Dictator” mode and I wasn’t going to deal with it.